So most book bloggers have a methodical system for deciding when they read books. They plan out their reading schedule based on when books are coming out. They post reviews close to publication dates so that the reviews are most valuable to readers and to publishers. They have organized calendars so they know what they are reading in advance and don’t impulsively pick books from piles when they are ready for a new one. 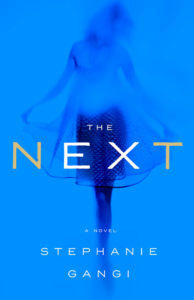 I then end up in situations like this one, where the book I just finished – The Next by Stephanie Gangi – isn’t due out until October. All I know is that I had to get my hands on it when I was at BEA, and I stalked it until I had it, and it was one of the few books I didn’t trust to put in the big box I mailed home. I carried this one home on the plane. I’m not sure why – it’s totally not my kind of book. The Next is about Joanna, a woman in her mid-40s who is dying of breast cancer. Her days are numbered, her prognosis very grim. Yet instead of spending her last precious hours with her desperate daughters, she is instead stalking her ex-boyfriend Ned on social media. He abandoned her during her illness – professing his love and devotion one day and then disappearing the next. And her anger and sadness at his betrayal is so profound that she cannot get past it. Even after her death. The Next is a difficult book to characterize. It’s literary fiction, but also a ghost story. Joanna returns after her death to haunt Ned and exact her revenge on him – so that part of the book isn’t exactly realistic. But the rest of it is, from the social media accounts Joanna stalks to the relationship between her beautifully flawed daughters and her incredibly sad, poignant death. I am not the supernatural type – I usually say that I read “realistic fiction” – but I still liked this book a lot. A few scenes where Joanna was haunting Ned were a little over the top for me – descriptions of the physical manifestation of her spirit in the room – but I got past them. Grangi is a good writer and her prose flowed fluidly with just the right amount of description. The plot moved forward swiftly, rotating among Ned, Joanna and her daughters, so you see things from Joanna’s rage-filled perspective as well as those of her grieving daughters and her rattled ex. It’s very easy to understand Joanna’s rage, which makes this book make sense. It’s the ultimate revenge fantasy. Like I said, The Next is a hard book to summarize. I suspect it’s going to get some attention when it comes out in the fall, and I will be sure to write about it then and link to this review. Until then, sorry for my disorganization and impulsive reading. I’ll try to stick to books that are actually available for the rest of the summer! Posted on July 5, 2016 by gayle. This entry was posted in Fiction and tagged ghost story, stephanie gangi, the next. Bookmark the permalink. This sounds really good so I’ll look for it when it comes out. This book sounds quite interesting. I have heard of it. Thanks for your input on it. I agree this sounds good! So many books, so little time right?